The type of produce available during the summer months is truly a glorious thing to behold. 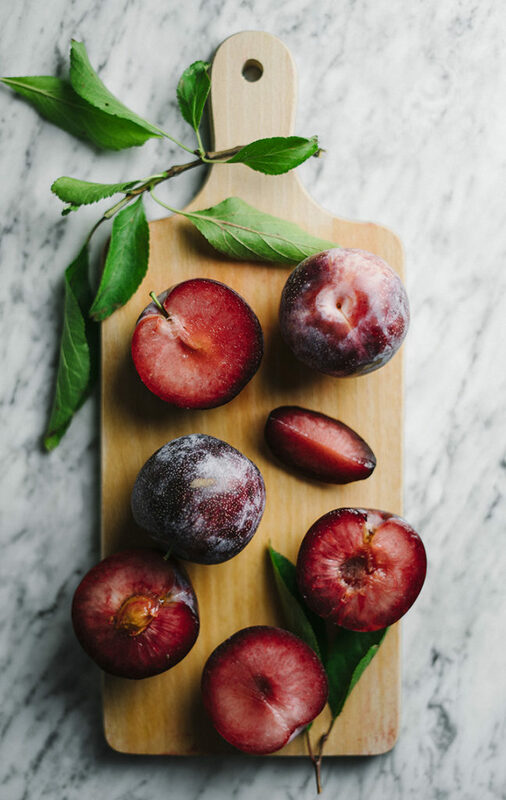 I have a great love for stone fruits, and as much as I adore peaches, the plums this summer have been stealing the show. 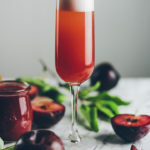 Plus the beautiful color they lend to various dishes and drinks is truly breathtaking, so this plum bellini cocktail seemed like a great way to put a few juicy summer plums to use. 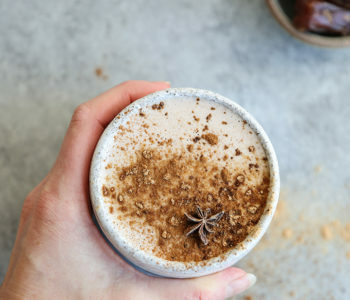 This refreshing summer cocktail is a variant of the ever-so-popular peach bellini—an invigorating mixture of stone fruit puree and effervescent Prosecco. 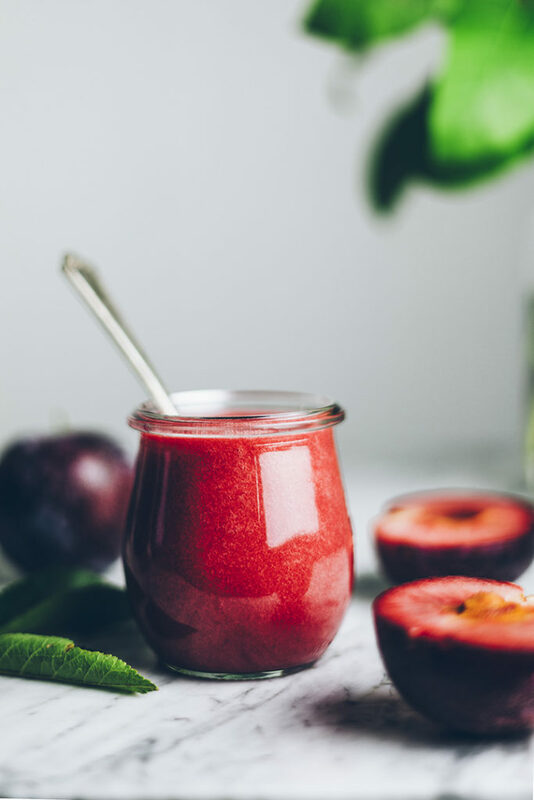 The combined sweetness and tartness of the farmer’s market Flavorosa plums imparts an exciting and dynamic flavor that complements the beautiful crimson magenta hue of the drink quite well. 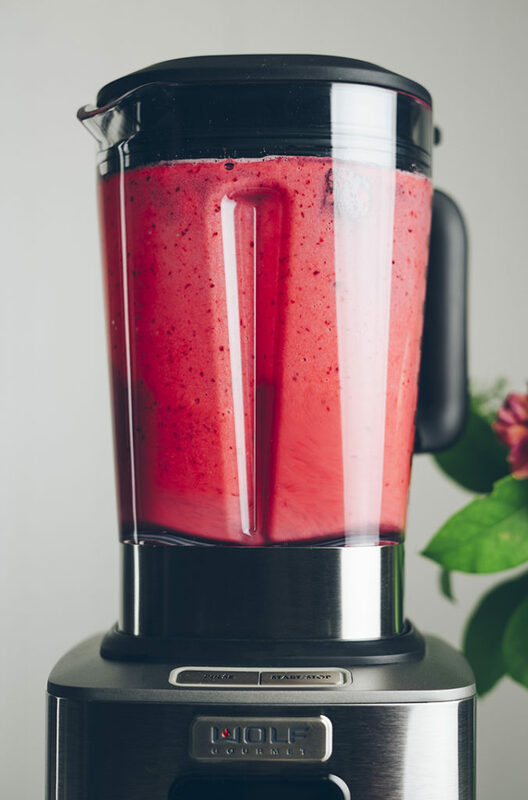 And with Wolf Gourmet’s high performance blender, creating this concoction couldn’t be easier. 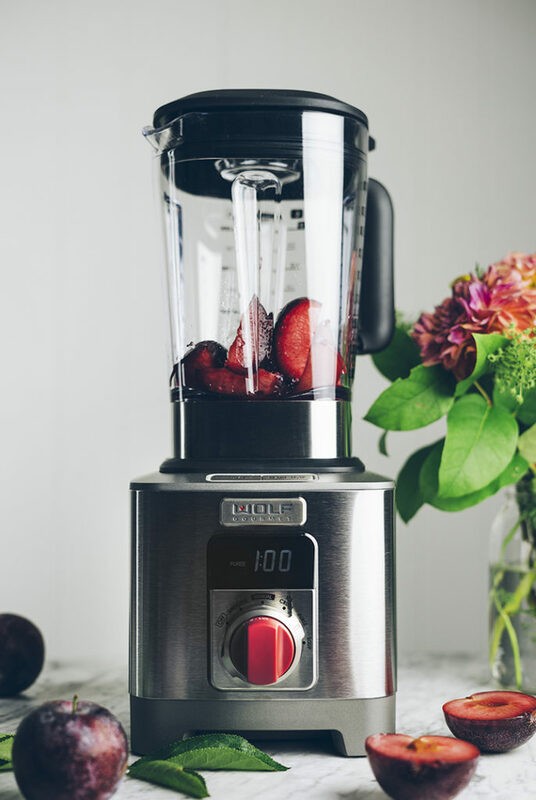 The blender features individual program settings, like smoothie, puree, and soup, so it practically does all the work for you. For this recipe, just toss in your prepared plums, toggle to the puree setting, and press start—the rest is taken care of. In no time you’ll have an utterly smooth and velvety plum puree. 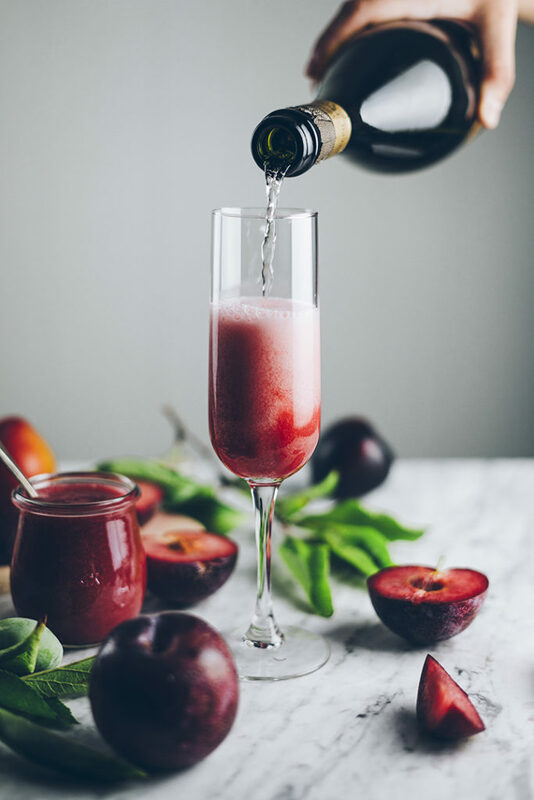 You can add as little or as much plum puree to your glass of Prosecco as you like. I have found that 2-3 tablespoons should do it, but let your own taste be your guide. 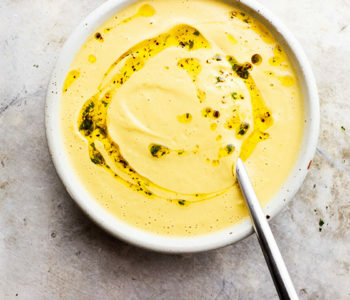 So once the puree is ready, simply mix this with some chilled Prosecco and you’ll be sipping on the perfect summertime drink in no time. 2-3 ripe plums about 9 oz. Quarter and slice each plum and place in a medium bowl; discard the pits. Sprinkle the plums with the sugar and lemon juice, stirring a few times to coat. Cover the plums and allow them to macerate at room temp for 1 hour, stirring once or twice. Pour the plums and their juices into the blender and select the puree setting. Strain the plum mixture through a fine mesh sieve and into a small bowl, discard solids (if any). Taste the puree, and add any additional sugar if needed. Place 2-3 tablespoons of the plum puree into a champagne flute and fill with 5-6 fl oz. of cold Prosecco. Serve immediately. 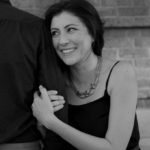 Kristan Raines is a recipe developer, photographer, stylist, and writer dedicated to exploring the beauty of seasonal fare. You can find more of her creations on her website, The Broken Bread. what a wonderful recipe, even after plum season, it works! 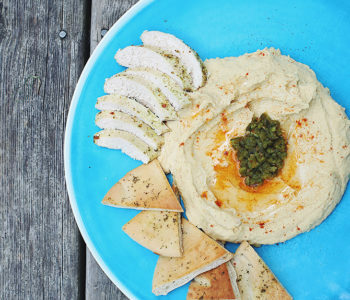 Love Posecco too in place of champagne, so thank you for this lovely recipe!